Headlines: Weather has been challenging this week but the weekend just gone produced some nice captures. Fish love these Winter conditions and the lakes are firing. 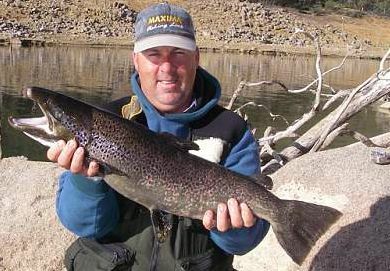 Lake Eucumbene:- Reports suggest that there are still some nice Browns around the edges on dark and a few Rainbows also. The dam wall has some great clear water at the moment and with the steeper banks you can polaroid some nice fish. Best flies this weekend will be large wets and yabby patterns and also Lumo patterns. 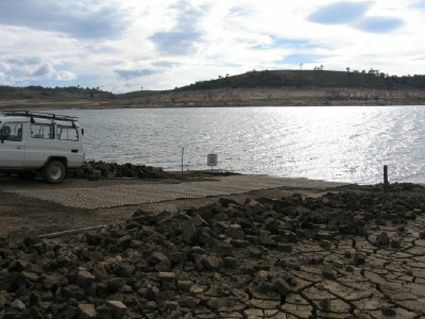 Lake Jindabyne:- Some great night fishing has been occuring at Jindabyne. Some have said it was the best night fly fishing they have had in a long time and others have had to leave them biting having bagged out. Fuzzy Wuzzy's, Hamills and Lumo's are the go. There have been good numbers of Brown and Rainbows in the river mouth area. As in Eucumbene the best time is on dark and throught the night. With fish having been spawning for over 5 weeks now, polaroiding is a worthwhile method when conditions allow. A very large high starting down low in the bight that will travel across and give still, calm and bright conditions is what to look for. Best patterns for this fishing are the stick caddis, midge pupa, and black and peacock. Fishing these inert under a indicator is often the best method. At other times a woolly bugger or Bushy's Horror will work. There is still a good chance of tangling with one of the Hatchery released Atlantic Salmon or Brook Trout over the next few weeks too. Some of the Atlantics may weigh up to 9kg! Rick Sunderland with a great fish polaroided in Jindabyne. Fish weighed 4kg. 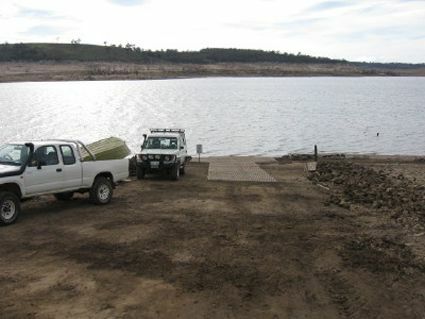 Eucumbene:- Best launching access is available at Buckenderra and Old Adaminaby. Below are photo's of the launching facilities at Buckenderra which have remained unchanged from last week and offer good access to the lake. Old Adaminaby's ramp is still very good and is suitable for boats up to the 5 and a bit metre mark. A 4WD is a definite advantage with the larger boats as the water is a little shallow so being able to drive out into the water can be necessary. Fishing in Eucumbene has been good with trolling accounting for some reasonable catches. A vast array of different lures have been working but the old favourites of Yellow Wing Tassies/Cobras going well as are hot pinks, reds and orange colours. Spinning the river mouth with Jackals, Vibes and Soft Plastics is a great way to fish at the moment too. 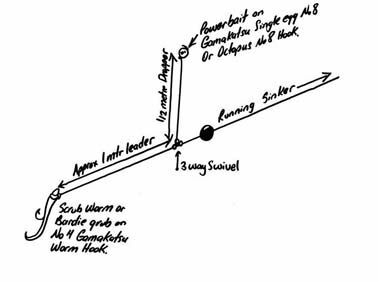 Berkley 3" Bass Minnows are a good choice or Small Squidgy Fish. Best areas for trolling are the river mouth, Cobrabald, Coppermine and Dam Wall. Anywhere that might have a little water running into the lake would be worth a spin with a soft plastic too. *Graham trolled the lake with one of the new Alpine Cobras in colour 222. He Caught three Rainbows and five Browns. 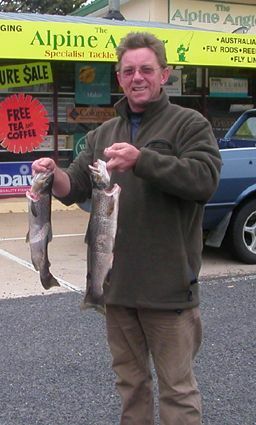 Jindabyne:- There have been some real quality fish from Jindabyne this week. Early and late has been the best with all methods, flat line, lead core, and downrigging producing fish. The River mouth and Island areas have been the best places to troll. Kalkite has been another great area to fish. Hot pink and Yellow wing Tassie devils have been excellent. 55, Y48 and Y82 in particular. Flatfish trolled dead slow in close have produced some nice fish, with one angler bagging out before 8am. 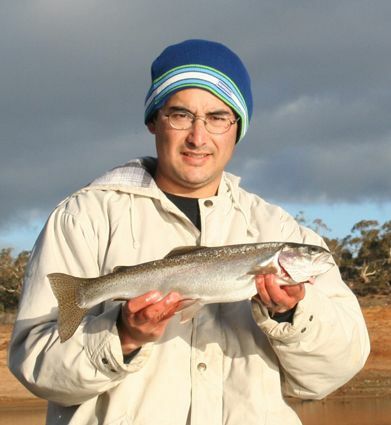 Baitfishing :- Bait fishing has been excellent with some good catches of mostly Rainbows in Jindabyne, and Eucumbene. Powerbait and Scrubworms have been the best baits. In Eucumbene try the Dam Wall or Old Adaminaby. Tantangara is well worth a fish at present too. I fished off the banks at Kalkite again on Saturday from 2.15 - 6.35 pm. undersized brook trout at 5.00 pm while spinning off the banks.